I drafted a summer bucket list. With the overwhelming heat still around, I wrote down a beach trip because on most days that seems like the only worthwhile activity. There will also be an outing to the carnival that’s close enough to take up a few free evenings. With the kids one by one finishing school, camp, or playgroup, very soon I’ll need a longer list of to dos to occupy my curious, energetic crew. My oldest daughter asked for a baking session, and when it’s just the two of us, it goes really well and we both enjoy ourselves. I’m thinking ice cream sandwiches are in order. I took a stroll at the shuk this week, I needed a few hard to find ingredients but even more I needed a little me time, because I know I’ll get very little of that in the next few weeks. The smell, the chaos, the sensory overload from the bright produce, colorful spices, and fragrant baked goods at Machane Yehuda leave me wide-eyed and inspired every time. I leave each stall having learned something new about where the food comes from or how its made. It makes me appreciate the small farms and the complexity of harvesting food in a land tied to its biblical guidelines. If it weren’t for the schlep home, I’d buy more than I need if for no other reason than the captivating peaches and limes, and towers of za’atar. It all looks fresh and enticing. I stopped by the fishmonger in hopes of leaving with something other than salmon. It’s the fish I’ve relied on because it’s familiar and dependable but the routine needed a shake up. He recommended a tender white fish called lebrak. “What does it taste like?” I asked, expecting to hear an attractive description. “A little like sea bass,” he answered, and I hoped I heard wrong because though many enjoy the meaty, fatty flesh of sea bass, I find it too soft for my taste. I asked him to fillet one small fish for me to try, he seemed insistent and I didn't want to embarrass my mother who’s old friends with his mother. I’ll feed it to my husband, at worse. Instead, I made fish tacos and ate them myself. This lebrak fish turned out to be a white, flaky fish that’s clean and does not resemble the distinct flavor of sea bass, yet it’s named European Sea Bass in Europe. I went back to get another round, but kept them whole this time. I knew stuffing them would yield a moist, flavorful meat. The stuffing had to be summery, so I opted for sundried tomatoes, mint, herbs, garlic, and more. It needed a sidekick, so of course, salad. Pan roasting the nectarines caramelized them just so to make things special but still simple. This is what summer dinners should be, almost effortless but realistic in process to know you’re making real, wholesome, good food. We all need more of that so this is one to consider. I’ll be honest, the kids were a little put off by the wholeness of the fish. I’m guessing it’s the eyeballs that took things over the edge. So one of them refused to get near the scary thing. To another, the bones were too cumbersome, and yet another thrives on air and sugar, so this didn’t seem like an appetizing dinner choice. You know your family, a fillet-ed fish might be a better choice. You can rub the paste all over it and bake. Now let the summer vacation begin. 2-3 pounds whole fish, such as European Seabass, White Fish, Red Snapper, etc. Wash your fish inside and out under cold running water and pat dry. Place it on a parchment lined baking sheet and slice through it if it isn’t already. Season the inside and outside of the fish with salt and pepper. 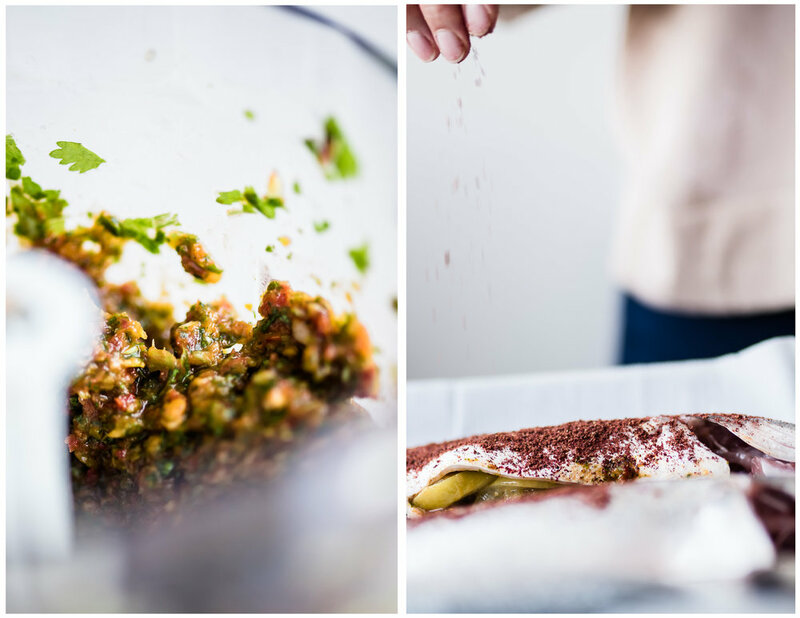 In a small food processor, process all the sundried tomato paste ingredients until smooth, adding a little more oil if the paste is too thick. Preheat oven to 400F. Divide the paste between the fish, smothering a generous amount inside each cavity and topping with preserved lemons. 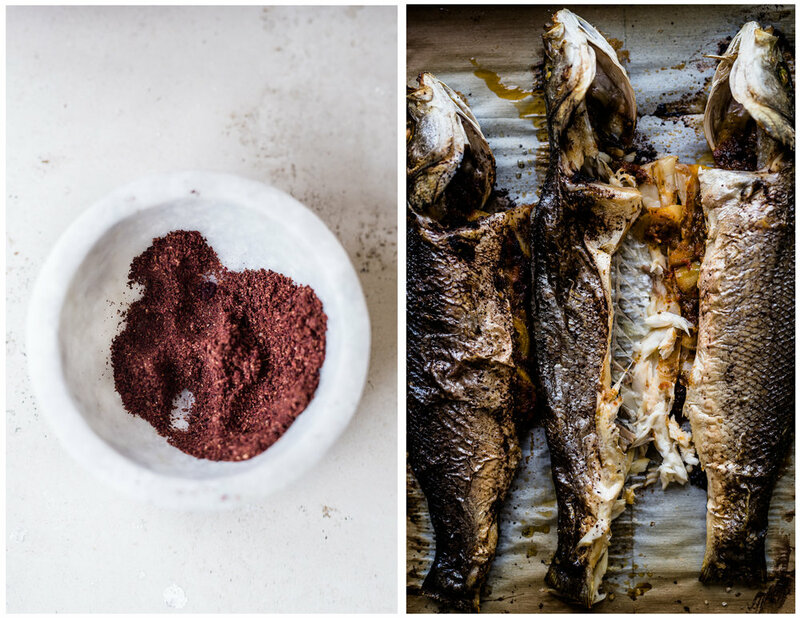 Sprinkle the sumac and olive oil over the flesh of the fish. Bake for 20-30 minutes or until the skin crisps up, and the meat flakes easily. Before serving, debone the fish and transfer to a platter. Serve with a squeeze of lime. In a small bowl, mix the nectarines with the olive oil, balsamic and salt. Heat a skillet or grill pan over medium heat, add the nectarines and cook until caramelized, about 4-5 minutes, flipping them once or twice. Remove from heat and allow to cool while you assemble the salad. In a large bowl, mix the arugula, red onion and green onions. Add the roasted nectarines and top with pepitas. In a jar, place all the vinaigrette ingredients and shake well. Pour over the salad and toss to mix. To serve, spoon salad onto a plate and top with fish.